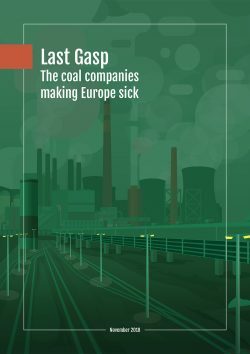 Berlin, 20 November 2018 – European coal companies including RWE, EPH, and PGE, continue to push the cost of dirty energy onto society, with air pollution from their coal plants burdening people across Europe with both health problems and billions in costs, according to modelling detailed in a new report. “Air pollution and climate change share a common driver: Coal. As both worsen, the costs to citizens grow. Like the IPCC’s recent warning that we only have 12 years to move beyond coal, this report makes the coal companies’ responsibility for air pollution crystal clear, as well as the duty of our decision makers to hold them accountable. They can both start protecting human health and the climate today, by ceasing investment into coal, by ending lobbying efforts for longer plant lives and yet more subsidies, and by committing to an ambitious and just transition away from coal by 2030 the latest,” said Nina Stros, EU Coal Campaign Lead at Greenpeace Central and Eastern Europe. The health impact methodology used in the report is guided by recommendations from the World Health Organization Europe’s “Health risks of air pollution in Europe” (HRAPIE) project on health impact assessments for air pollution. It includes atmospheric modelling with the European Monitoring and Evaluation Programme Meteorological Synthesizing Centre – West (EMEP MSC-W) computer model, which is also used by the European Environment Agency for European Commission assessments of health impacts from air pollution in Europe. This report does not attempt to quantify actual health occurrences nor their actual costs. While four of the ten most polluting companies have their main coal plants in Germany (RWE, EPH, Uniper and Steag), RWE remains the most damaging to human health by a wide margin. Three companies are from Poland (PGE, ENEA and ZE PAK), and there is one each from Spain (Endesa), Czech Republic (ČEZ) and Bulgaria (Bulgarian Energy Holding). German coal companies dominate the list because the country alone is responsible for 36% of all coal-based electricity generation in the EU. It is estimated that RWE alone caused up to €5.4 billion of associated health costs in 2016, and there are eight coal companies: EPH, PGE, ČEZ, Uniper, Endesa, ENEA, Steag and ZE PAK, with health costs of over a billion Euros each. These costs are not covered by the companies, but rather by society in the form of increased national healthcare budgets, personal costs for individual treatment and economic losses caused by reduced productivity.